Pretty Palm Speeds are already hitting stores - from a NorCal Showroom store. 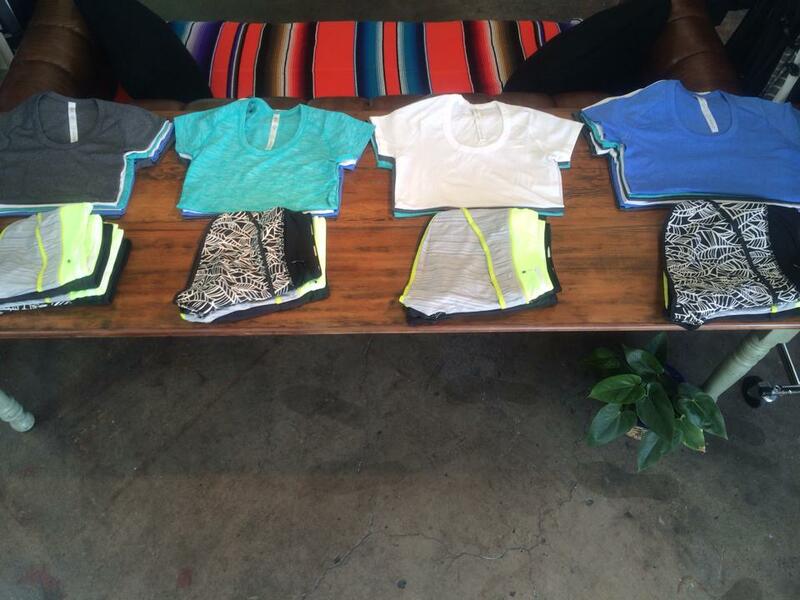 I'll be curious to try the new Run Times shorts. I assume the Run Times are the Groovy Run Replacement since they have a zipper waistband pocket. I like that they look like Speed shorts in the back. I'll definitely order them to give them a try. The Pretty Palm Run a Marathon Crop IIs are nice, too, but I can't remember why I never got into that style of crop the first time around. Omg. Dart And dash are back! ! The Run A Marathon crops (prior) are awesome. 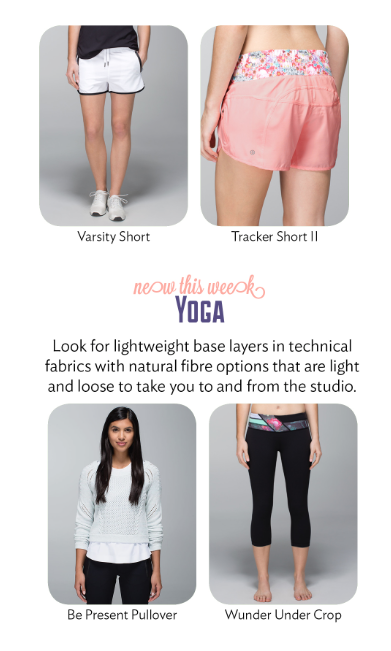 Lightweight, compressive, knee length, and so comfortable. They have the extra pockets for gels and items you need on really long runs. The only thing I didn't really care for (but understood) was the grippy details on the outside of the crop near the hip (to keep your shirt from riding up). They weren't a deal breaker though when I bought them. I have a version that's black with a wafs blue/green waistband. I will have to check out the new version. I got rid of my run a marathon crops because the length hit me right behind the knee and caused discomfort. Just the wrong length for a short person I guess but I love all the functional pockets. @LLA.......I asked this before. Is that the return of the Chai Time with the pocket, featured in the High Time* Mesh photos on LLL????? Thanks anon 5:54 for the review. I've never had the Run A Marathon crops but those extra pockets are a must for me & I love this print, so I'll be ordering. Lulu is killing my wallet with all the great new pieces & colors lately! I bought a pair of run a marathon crops off the lulu exchange FB group and I love them. They're a great crop overall. I will definitely be looking into getting another pair! Does anyone know if the dart and dash shorts have the grippy hem? I've passed on the track and train because it was missing that feature. I would love for lulu to bring back the shorty short. I wore those this morning for a 10 mile long run (my go-to for hot Florida summer long runs) and they are just so awesome. F YES TO RETURN OF DART AND DASH SHORTS!!! OT - LLA: Since the Whamo Camo Scuba Hoodie was spotted in outlets, does that typically mean it won't make full price stores or the website? @ anon 9 am - which photo are you referring to? I didn't see a photo of the new mesh High Times on the website, at least the US and Canadian sides of the site. Those mesh High Times tights are definitely on the US site. I know what sweater the commenter is referring to too, but I don't know the answer. Sorry. I am really excited about those pink flowabunga tracker ii shorts! Eeeee one of my pairs or Dart and Dash just bit the dust (I ran in them at least once a week!) and I was getting antsy about whether lulu would bring them back or not. Yay! @anon 12:46 - the 2012 version of the dart and dash shorts did not have grippy hems. @ anon 3:48 pm / anon 9 am - you are right. I don't know how I missed them. That looks like a new sweater style that will be coming. 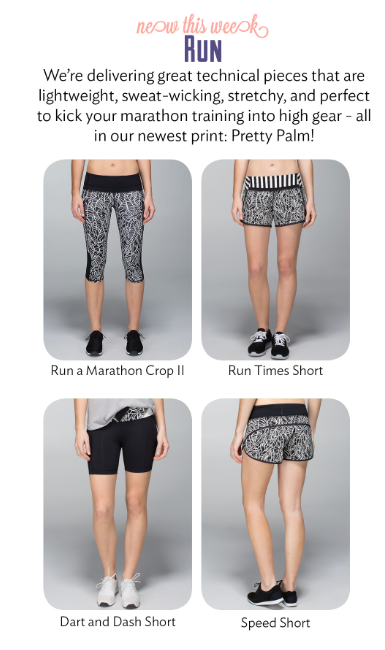 So excited Run A Marathon crops are back!!! They are THE best crops for long runs and races! 7 pockets!!! I cannot wait! Also digging the look of the new Pace Rival skirts! I am going to be in trouble this next upload, I can already tell! @Anon 9:00 a.m., I have no idea about whether that sweater is "... the Chai Time with the pocket, featured in the High Time* Mesh photos on LLL?????" But I'm definitely interested in this sweater myself! It wasn't apparent from my cell phone screen, but whatever it is, the fabric's pretty sheer, as I can see the exercise bra she has on beneath it when viewing these images on my laptop computer. I have a feeling the Memorial Day upload is going to be VERY costly, lol!!! I have a pair of the run a marathon crops as well. they have the blue we are from space pattern and I think they are great running crops, very light weight and they hold up in the heat. Still debating which pair to get. Leaning towards the pretty palm pattern.